What a pleasure and an honor to have been invited back to Julia Galef's awesome podcast, Rationally Speaking! If you don't know Rationally Speaking, check it out. The podcast weaves together ideas and guests from psychology, philosophy, economics, and related fields; and Julia has a real knack for the friendly but probing question. In this episode, Julia and I discuss the value of truth, daringness, and wonder as motives for studying philosophy; the hazards of interpreting other thinkers too charitably; and our lack of self-knowledge about the stream of conscious experience. (1.) In 25 years, employers will have the technological capacity to directly control their employees' moods. (2.) Employers will not refrain from exercising that capacity. (3.) Most working-age adults will be employees. (4.) Therefore, in 25 years, most working-age adults will have employers who directly control their moods. The argument is valid in the sense that the conclusion (4) follows if all of the premises are true. Premise 1 seems plausible, given current technological trajectories. Control could be either pharmacological or via direct brain stimulation. Pharmacological control could, for example, be through pills that directly influence your mood, energy levels, ability to concentrate, feeling of submissiveness, or passion for the type of task at hand. Direct brain stimulation could be through a removable TMS helmet that magnetically stimulates and suppresses neural activity in different brain regions, or with some more invasive technology. McDonald's might ask its cashiers to tweak their dials toward perky friendliness. Data entry centers might ask their temp workers to tweak their dials toward undistractable focus. Brothels might ask their strippers to tweak their dials toward sexual arousal. Contra Premise 1, society might collapse, of course, or technological growth could stall or proceed much more slowly. If it's just slower, then we can replace "25 years" with 50 or 100 and retain the rest of the argument. It seems unlikely that moods are too complex or finicky to be subject to fairly precise technological control, given how readily they can be influenced by low-tech means. I don't know to what extent people in Silicon Valley, Wall Street, and elite universities already use high-tech drugs to enhance alertness, energy, and concentration at work. That might already be a step down this road. Indeed, coffee might partly be seen this way too, especially if you use it to give your all to work, and then collapse in exhaustion when the caffeine wears off and you arrive home. My thought is that in a few decades the interventions might be much more direct, effective, and precisely targeted. Premise 2 also seems plausible, given the relative social power of employers vs. employees. As long as there's surplus labor and a scarcity of desirable jobs, then employers will have some choice about whom to hire. If Starbucks has a choice between Applicant A who is willing to turn up the perky-friendly dial and otherwise similar Applicant B who is not so willing, then they will presumably tend to prefer Applicant A. If the Silicon Valley startup wants an employee who will crank out intense 16-hour days one after the next, and the technology is available for people to do so by directly regulating their moods, energy levels, focus, and passion, then the people who take that direct control, for their employers' benefit, will tend to win the competition for positions. If Stanford wants to hire the medical researcher who is publishing article after article, they'll find the researcher who dialed up her appetite for work and dialed down everything else. Contra Premise 2, (a.) collective bargaining might prevent employers from successfully demanding direct mood control; or (b.) governmental regulations might do so; or (c.) there might be a lack of surplus labor. Rebuttal to (a): The historical trend recently, at least in the U.S., has been against unionization and collective bargaining, though I guess that could change. Rebuttal to (b): Although government regulations could forbid certain drugs or brain technologies, if there's enough demand for those drugs or technologies, employees will find ways to use them (unless enforcement gets a lot of resources, as in professional sports). Government regulations could specifically forbid employers from requiring that their employees use certain technologies, while permitting such technologies for private use. (No TMS helmets on the job.) But enforcement might again be difficult; and private use vs. use as an employee is a permeable line for the increasing number of jobs that involve working outside of a set time and location. Also, it's easier to regulate a contractual demand than an informal de facto demand. Presumably many companies could say that of course they don't require their employees to use such technologies. It's up to the employee! But if the technology delivers as promised, the employees who "voluntarily choose" to have their moods directly regulated will be more productive and otherwise behave as the company desires, and thus be more attractive to retain and promote. Rebuttal to (c): At present there's no general long-term trend toward a shortage of labor; and at least for jobs seen as highly desirable, there will always be more applicants than available positions. Premise 3 also seems plausible, especially on a liberal definition of "employee". Most working-age adults (in Europe and North America) are currently employees of one form or another. That could change substantially with the "gig economy" and more independent contracting, but not necessarily in a way that takes the sting out of the main argument. Even if an Uber driver is technically not an employee, the pressures toward direct mood control for productivity ought to be similar. Likewise for computer programmers and others who do piecework as independent contractors. If anything, the pressures may be higher, with less security of income and fewer formal workplace regulations. 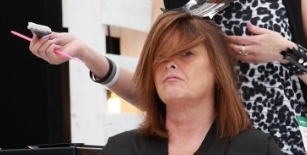 Thinking about Premises 1-3, I find myself drawn to the conclusion that my children's and grandchildren's employers are likely to have a huge amount of coercive control over their moods and passions. 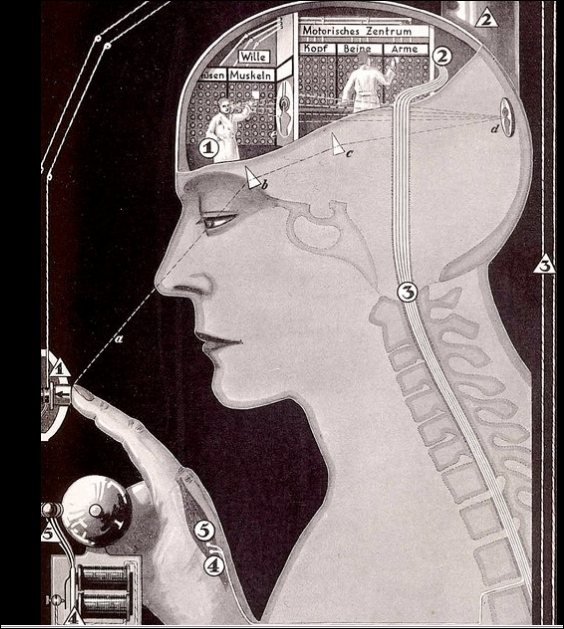 "What Would (or Should) You Do with Administrator Access to Your Mind?" (guest post by Henry Shevlin, Aug 16, 2017). "Crash Space" (a short story by R. Scott Bakker for Midwest Studies in Philosophy). "My Daughter's Rented Eyes" (Oct 11, 2016). Hugh D. Reynolds has written up a fun, vivid summary of my talk at Oxford Brookes last spring, on fiction writing for philosophers! Eric Schwitzgebel has a pleasingly liberal view of what constitutes philosophy. A philosopher is anyone wrestling with the “biggest picture framing issues” of... well, anything. In a keynote session at the Fiction Writing for Philosophers Workshop that was held at Oxford Brookes University in June 2017, Schwitzgebel, Professor of Philosophy at the University of California, Riverside, shared his advice–which he stated would be both practical and impractical. Schwitzgebel tells us of a leading coiffeur who styles himself as a “Philosopher of Hair”. We laugh – but there’s something in this – the vagary, the contingency in favoured forms of philosophical output. And it’s not just hairdressers that threaten to encroach upon the Philosophy Department’s turf. Given that the foundational issues in any branch of science or art are philosophical in nature, it follows that most people “doing” philosophy today aren’t professional philosophers. There are a host of ways one could go about doing philosophy, but of late a consensus has emerged amongst those that write articles for academic journals: the only proper way to “do” philosophy is by writing articles for academic journals. Is it time to re-stock the tool shed? Philosophical nuts come in all shapes and sizes; yet contemporary attempts to crack them are somewhat monotone. Too exclusive a focus on technical journal articles excludes non-academics from the dialogue — or maybe, better said, excludes us philosophers from non-academics’ more important dialogue. Thanks also to Helen De Cruz for setting up the talk and to Skye Cleary for finding a home for Hugh's account on the APA blog. Should You Referee the Same Paper Twice, for Different Journals? Uh-oh, it happened again. That paper I refereed for Journal X a few months ago -- it's back in my inbox. Journal X rejected it, and now Journal Y wants to know what I think. Would I be willing to referee it for Journal Y? In the past, I've tended to say no if I had previously recommended rejection, yes if I had previously recommended acceptance. If I'd previously recommended rejection, I've tended to reason thus: I could be mistaken in my negative view. It would be a disservice both to the field in general and to the author in particular if a single stubborn referee prevented an excellent paper from being published by rejecting it again and again from different journals. If the paper really doesn't merit publication, then another referee will presumably reach the same conclusion, and the paper will be rejected without my help. If I'd previously recommended acceptance (or encouraging R&R), I've tended to just permit myself think that the other journal's decision was probably the wrong call, and it does no harm to the field or to the author for me to serve as referee again to help this promising paper find the home it deserves. I've begun to wonder whether I should just generally refuse to referee the same paper more than once for different journals, even in positive cases. Maybe if everyone followed my policy, that would overall tend to harm the field by skewing the referee pool too much toward the positive side? I could also imagine arguments -- though I'm not as tempted by them -- that it's fine to reject the same paper multiple times from different journals. After all, it's hard for journals to find expert referees, and if you're confident in your opinion, you might as well share it widely and save everyone's time. I'd be curious to hear about others' practices, and their reasons for and against. I defend a how-possibly argument for Kantian (or Kant*-ian) transcendental idealism, drawing on concepts from David Chalmers, Nick Bostrom, and the cyberpunk subgenre of science fiction. If we are artificial intelligences living in a virtual reality instantiated on a giant computer, then the fundamental structure of reality might be very different than we suppose. Indeed, since computation does not require spatial properties, spatiality might not be a feature of things as they are in themselves but instead only the way that things necessarily appear to us. It might seem unlikely that we are living in a virtual reality instantiated on a non-spatial computer. However, understanding this possibility can help us appreciate the merits of transcendental idealism in general, as well as transcendental idealism's underappreciated skeptical consequences. As always, I welcome comments, objections, and discussion either as comments on this post or by email to my UCR email address. According to Nomy Arpaly and Zach Barnett, some philosophers prefer Truth and others prefer Dare. I love the distinction. It helps us see an important dynamic in the field. But it's not exhaustive. I think there are also Wonder philosophers. As I see the distinction, Truth philosophers sincerely aim to present the philosophical truth as they see it. They tend to prefer modest, moderate, and commonsensical positions. They tend to recognize the substantial truth in multiple different perspectives (at least once they've been around long enough to see the flaws in their youthful enthusiasms), and thus tend to prefer multidimensionality and nuance. Truth philosophers would rather be boring and right than interesting and wrong. Dare philosophers reach instead for the bold and unusual. They want to explore the boundaries of what can be defended. They're happy for the sake of argument to champion unusual positions that they might not fully believe, if those positions are elegant, novel, fun, contrarian, or if they think the positions have more going for them than is generally recognized. Dare philosophers sometimes treat philosophy like a game in which the ideal achievement is the breathtakingly clever defense of a position that others would have thought to be patently absurd. There's a familiar dynamic that arises from their interaction. The Dare philosopher ventures a bold thesis, cleverly defended. ("Possible worlds really exist! ", "All matter is conscious! ", "We're morally obliged to let humanity go extinct!") If the defense is clever enough, so that a substantial number of readers are tempted to think "Wait, could that really be true? What exactly is wrong with the argument?" then the Truth philosopher steps in. The Truth philosopher finds the holes and presuppositions in the argument, or at least tries to, and defends a more seemingly sensible view. This Dare-and-Truth dynamic is central to the field and good for its development. Sometimes there's more truth in the Dare positions than one would have thought, and without the Dare philosophers out there pushing the limits, seeing what can be said in defense of the seemingly absurd, then as a field we wouldn't appreciate those positions as vividly as we might. Also, I think, there's something intrinsically valuable about exploring the boundaries of philosophical defensibility, even if the positions explored turn out to be flatly false. It's part of the magnificent glory of life on Earth that we have fiendishly clever panpsychists and modal realists in our midst. Why study philosophy? I mean at a personal level. Personally, what do you find cool, interesting, or rewarding about philosophy? One answer is Truth: Through philosophy, you discover answers to some of the profoundest and most difficult questions that people can pose. Another answer is Dare: It's fun to match wits, push arguments, defend surprising theses, win the argumentative game (or at least play to a draw) despite starting from a seemingly indefensible position. Both of those motivations speak to me somewhat. But I think what really delights me more than anything else in philosophy is its capacity to upend what I think I know, its capacity to call into question what I previously took for granted, its capacity to cast me into doubt, confusion, and wonder. Unlike the Dare philosopher, the Wonder philosopher is guided by a norm of sincerity and truth. It's not primarily about matching wits and finding clever arguments. Unlike the Truth philosopher, the Wonder philosopher has an affection for the strange and seemingly wrong -- and is willing to push wild theses to the extent they suspect that those theses, wonderfully, surprisingly, might be true. But in the Dare-and-Truth dynamic of the field, the Wonder philosopher can struggle to find a place. Bold Dare articles and sensible Truth articles both have a natural home in the journals. But "whoa, I wonder if this weird thing might be true?" is a little harder to publish. Probably no one is pure Truth, pure Dare, or pure Wonder. We're all a mix of the three, I suspect. Thus, one approach is to leave Wonder out of your research profile: Find the Truth, where you can, publish that, and leave Wonder for your classroom teaching and private reading. Defend the existence of moderate naturalistically-grounded moral truths in your published papers; read Zhuangzi on the side. (1.) Find a Dare-like position that you really do sincerely endorse on reflection, and defend that -- optionally with some explicit qualifications indicating that you are exploring it only as a possibility. (2.) Explicitly argue that we should invest a small but non-trivial credence in some Dare-like position -- for example, because the Truth-type arguments against it aren't fully compelling. (3.) Find a Truth-like view that generates Wonder if it's true. For example, defend some form of doubt about philosophical method or about the extent of our self-knowledge. Defend the position on sensible, widely acceptable grounds; and then sensibly argue that one possible consequence is that we don't know some of the things that we normally take for granted that we do know. (4.) 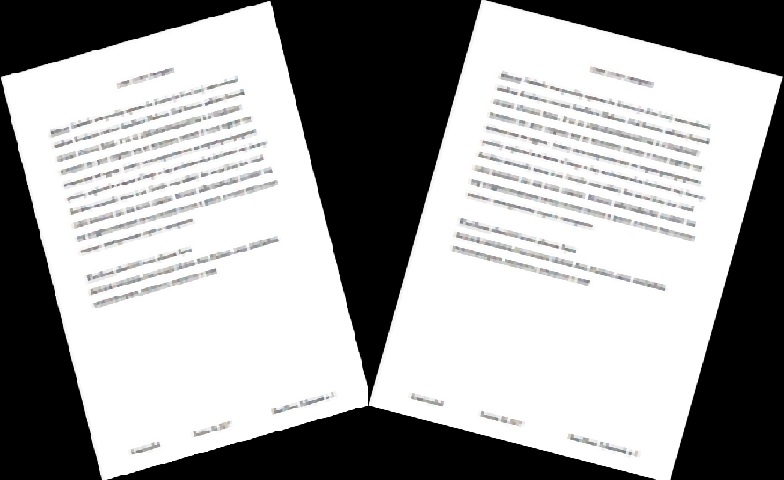 Write about historical philosophers with weird and wonderful views. This gives you a chance to explore the Wonderful without committing to it. In retrospect, I think one unifying theme in my disparate work is that it fits under one of these four heads. Much of my recent metaphysics fits under (1) or (2) (e.g., here, here, here). My work on belief and introspection mostly fits under (3) (with some (1) in my bolder moments): We can't take for granted that we have the handsome beliefs (e.g., "the sexes are intellectually equal") that we think we do, or that we have the moral character or types of experience that we think we do. And my interest in Zhuangzi and some of the stranger corners of early introspective psychology fits under (4). Do Philosophy Professors Tend to Come from Socially Elite Backgrounds? To judge from the examples we use in our essays, we philosophers are a pretty classy bunch. Evidently, philosophers tend to frequent the theater, delight in expensive wines, enjoy novels by George Eliot, and regret owning insufficiently many boats. Ah, the life of the philosopher, full of deep thoughts about opera while sipping Château Latour and lingering over 19th-century novels on your yacht! Maybe it's true that philosophers typically come from wealthy or educationally elite family backgrounds? Various studies suggest that lower-income students and first-generation college students in the U.S. and Britain are more likely to choose what are sometimes perceived as lower risk, more "practical" majors like engineering, the physical sciences, and education, than they are to choose arts and humanities majors. To explore this question, I requested data from the National Science Foundation's Survey of Earned Doctorates. The SED collects demographic and other data from PhD recipients from virtually all accredited universities in the U.S., typically with response rates over 90%. What is the highest educational attainment of your mother and father? Did you earn college credit from a community or two-year college? Before you read on... any guesses about the results? 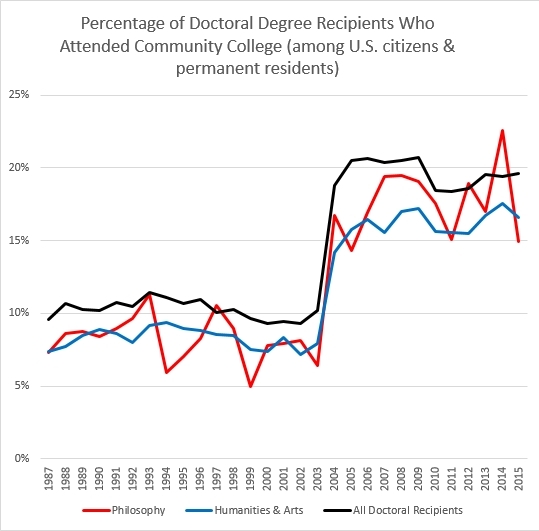 Merging the 2004-2015 data for analysis, 17% of philosophy PhD recipients had attended community college, compared to 15% of other arts and humanities PhDs and 19% of PhDs overall. Pairwise comparisons: philosophy 696/4107 vs. arts & humanities overall (excl. phil.) 7051/45966 (z = 2.7, p = .006); vs. all PhD recipients (excl. phil.) 69958/372985 (z = -3.0, p = .003). 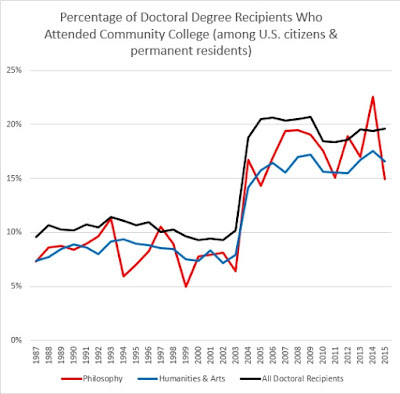 In sum, as measured by rates of community college attendance, philosophers' educational background is only a little more elite than that of PhD recipients overall and might be slightly less elite, on average, than that of PhD recipients in the other arts and humanities. The SED divides parental education levels into four categories: high school or less, some college, bachelor's degree, or advanced degree. 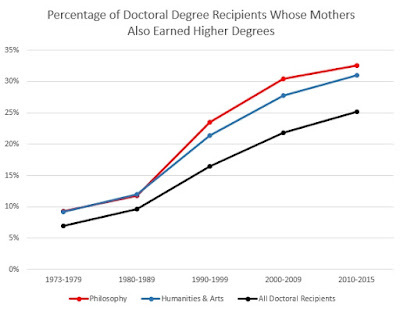 Philosophers report higher levels of parental education than do other PhD recipients. In 2010-2015, 45% of philosophy PhD recipients reported having fathers with higher degrees and 33% reported having mothers with higher degrees, compared to 43% and 31% in the arts and humanities generally and 35% and 25% among all PhD recipients (philosophers' fathers 1129/2509 vs. arts & humanities' fathers (excl. phil.) 11110/26064, z = 2.3, p = .02; philosophers' mothers 817/2512 vs. a&h mothers 8078/26176, z = 1.7, p = .09). Similar trends for earlier decades suggest that the small difference between philosophy and the remaining arts and humanities is unlikely to be chance. Although philosophy has a higher percentage of men among recent PhDs (about 72%) than do most other disciplines outside of the physical sciences and engineering, this fact does not appear to explain the pattern. Limiting the data either to only men or only women, the same trends remain evident. Unsurprisingly, parental education is much higher in general among PhD recipients than in the U.S. population overall: Approximately 12% of people over the age of 25 in the US have higher degrees (roughly similar for all age groups, including the age groups that would be expected of the parents of recent PhD recipients). In sum, the parents of PhD recipients in philosophy tend to have somewhat higher educational attainment than PhD recipients overall and slightly higher educational attainment that PhD recipients in the other arts and humanities. However, much of this difference may be explainable by the overrepresentation of non-Hispanic whites within philosophy, rather than by a field-specific factor. Although PhD recipients in general tend to come from more educationally privileged backgrounds than do people who do not earn PhDs, philosophy PhD recipients do not appear to come from especially elite academic backgrounds, compared to their peers in other departments, despite our field's penchant for highbrow examples. ETA2: On my public Facebook link to this post, Wesley Buckwalter has emphasized that not all philosophy PhDs become professors. Of course that is true, though it looks like a majority of philosophy PhDs do attain permanent academic posts within five years of completion (see here). If it were the case that people with community college credit or with lower levels of parental education were substantially less likely than others to become professors even after completing the PhD, then that would undermine the inference from these data about PhD recipients to conclusions about philosophy professors in general.